Clear + Brilliant is a gentle laser skin care treatment, clinically proven to help fight and prevent the effects of aging skin. Clear + Brilliant Perméa Hand Piece Goes The Extra Step. 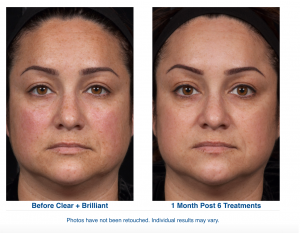 There’s no question that Clear + Brilliant delivers real results. In clinical studies, Clear + Brilliant helped refresh skin tone and texture. Time after time, Clear + Brilliant patients reported looking and feeling younger and rediscovering their skin’s natural radiance and smoothness. 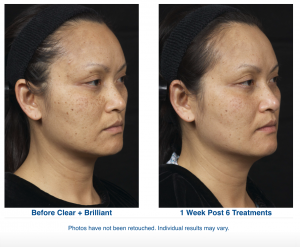 For our patients, these are the kind of results that speak volumes. Clear + Brilliant — Love Your Skin. 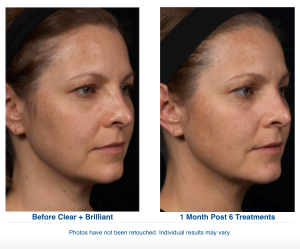 The Clear + Brilliant laser system is based on advanced technology, but getting Clear + Brillianttreatments is simple. All treatments begin with a consultation with your licensed skin care professional to see if Clear + Brilliant is right for you – and to pinpoint some of the key trouble spots it can help address. From there, your provider can recommend a Clear + Brilliant treatment regimen that’s right for you.